In the latest chapter of “interesting people and information find you after you publish a book,” I received an e-mail a little while back from today’s Pinkerton agency. This was actually my first contact with the firm; in researching my book there seemed little need to bother them given that 1) aside from a few brief notes about subsequent decades, my examination of the Pinkertons leaves off with William Pinkerton’s death 90 years ago, and 2) most of their surviving early archives have been donated to the Library of Congress. Still, it’s always fun to receive feedback on my work, and the nice woman who contacted me was very generous in offering to answer questions I might have. Perhaps the most interesting information I received from this exchange, though, was an indirect tip-off that Pinkerton has updated its web presence. For what my opinion as a designer and amateur historian is worth, the revised site appears highly polished and professional, as well as a more compelling portrait than the government-services-led version online when I was writing my book. The new history page is an especially thoughtful addition, offering a quick scroll through significant events from Pinkerton’s century and a half story, as well as a selection of interesting photos. A number of these are familiar though a few were not; alas, one particular image of a woman with a highly tantalizing file name is not a genuine contemporary image of the elusive Kate Warne. The image does come with an interesting story, all the same, as it is most likely a sketch created (possibly by this gentleman?) some years ago as part of a television program pitch. Neat, eh? Allan Pinkerton’s country estate, The Larches, was admittedly never truly lost. But it did disappear from the place of prominence it once occupied, rather like most of history’s notable real-life detectives other than Pinkerton, in fact. Like their stories, The Larches has still been there, just obscure. And just as with Pollaky, Burns, and even the younger Pinkertons, present-day obscurity has not always been the case. Onarga, Illinois has never been a major destination, exactly, but once upon a time it was the regular retreat of a fairly famous man and played host to other powerful and connected figures. That changed following the death of Allan Pinkerton in 1884. During research for my book, I read hints that The Larches had become “a ruin” by the 1960s, but some further investigation has recently turned up more details. A kind correspondent has replied to my inquiries with much fascinating information. In an earlier post, I demonstrated what Brilliant Deduction describes as the Pinkerton family’s “stern economy with given names.” Among the branch of the family of import for detective history, at any rate, male children seem to receive one or another of just three first names, over and over: Allan, William or Robert. In pondering on this practice, it readily occurred to me that two of those three names may have been treasured, in part, for their prominence in Scottish history. William and Robert have been among the country’s most revered names for quite a long while (even before Mel Gibson got involved). By the 19th century, the names’ place in their own family tradition may have meant more to the Pinkertons, but there is at least an obvious possible explanation for why they might have latched onto those names in the first place. For Allan, though, I’ve really been at a loss. I thought there might be some other famous Scot behind that name, as well, but having looked into it I’ve not found much. Wikipedia offers up a poet named Allan Ramsay, but it seems a bit of a stretch. I could be wrong but I’ve got to guess he had little influence on the name’s significance in the Pinkerton family. The web site of a James Allan (somehow lingering at Geocities, perhaps still online only because someone at Yahoo missed it when shutting things down?) lists a few other “famous Allans” of Scotland, but none of them seem much more convincing than Ramsay. His note about the history of the name itself suggests, like other sources, that it was probably a Breton name that crossed The Channel along with William the Conqueror’s invasion of England. What’s more, the little I can find about the origins of “Pinkerton” describes it as an English name, also. Like so much that is “English,” it probably came from continental Europe as part of some migration/invasion, as well; I’m not sure what to make of the first half but the “-ton” suffix is presumably of Germanic origin. So, that’s the Pinkertons: a patriotic Scottish family with English names of French and German etymology, who in very American fashion decided to leave most of that baggage behind and “make a name for themselves” in the New World, attaching an entirely new significance to that name in the process. Butch Cassidy, beyond the grave? A few notes on the interesting work I finished, recently, Butch Cassidy: Beyond the Grave by W.C. Jameson. Butch and his partner Sundance (who was probably not his closest friend or partner-in-crime, as Mr. Jameson observes in the process of brushing aside the many endearing myths about the pair) receive the briefest, one-line aside mention in Brilliant Deduction. But the Pinkertons’ interest in the pair was considerably more enduring (and indeed, as said aside notes, more enduring than that of their financier clients who were content to drop pursuit of the pair once they left the country). Thus they turn up repeatedly in the pages of Butch Cassidy, or at least their files do; William, Robert and a few agents appear in person now and then, but for the most part the Pinkertons are simply an agency, hovering in the background and compiling notes in preparation for a reckoning that never came. During the time of the so-called shootout in San Vicente [the one dramatized in the much-loved film with Newman and Redford], the Pinkertons probably knew more about the location and activities of Cassidy and Harry Longabaugh [i.e. Sundance] than anyone. A thorough search of the files of the Pinkerton National Detective Agency yields no information to suggest that they ever believed Butch Cassidy had been killed in San Vicente. As much as I love the 1969 movie, and its iconic ending, Jameson makes a compelling case that the Pinkertons’ skepticism about the banditos yanquis‘ alleged demise was warranted, too. I read once that “There will never be anything more interesting in America than that Civil War.” Apparently this is a Gertrude Stein quote. I would say that it also, if arguable as a hard fact, certainly expresses a real truth. One hundred fifty years later the Civil War continues to fascinate us. It was, also, kind of a big deal at the time. Which probably doesn’t need illustration, though just how big it was may, perhaps, escape some people. I recall years ago, a friend returning from South Carolina where it seemed to her like a cease-fire had only been declared the week before, and then during our conversation remarking “well, that wasn’t a big deal for people up here [Iowa], was it?” In response I suggested that, actually, it was a very big deal, even up in Iowa. (Wikipedia suggests that it was, indeed, a proportionately bigger deal in Iowa than in any other state by one measure.) Still, I can see how one might think that the Civil War was a very regional phenomenon. Nearly all of the big set-piece battles that define a basic course of study were in the southeastern states, compared with which the total area of the “lower 48” states seems awfully big. Nonetheless, the phenomenon of The Civil War was in fact even bigger, and it’s possible that the history of the great detectives examined in Brilliant Deduction constitutes as effective an illustration of this as anything. The title of this post could almost be an alternate title for Brilliant Deduction, I sometimes think. If the stories of Henry Meyer(s) are the strangest coincidence of names out of the many I encountered in my research and writing, the stories of William, William and more Williams ad infinitum deserve some sort of record for sheer volume. 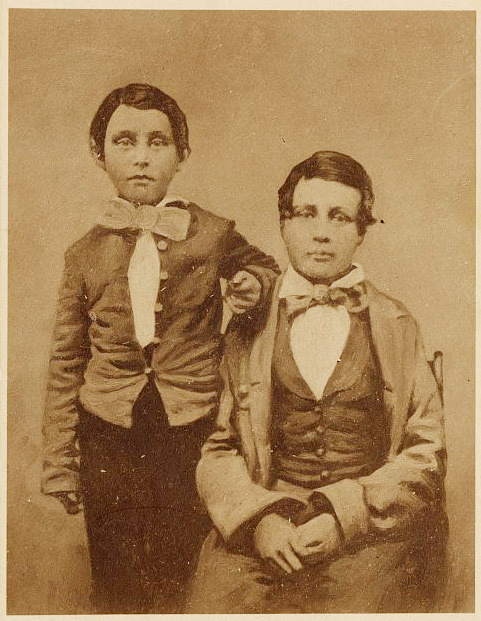 Wee William and Robert Pinkerton, c. 1855. Library of Congress. Adorable. I can just imagine that beginning in the early 1860s, this is the photo that Bill and Bob just dreaded Mom getting out in front of their friends. Luckily for them, Facebook wouldn’t exist for about 150 years, at least. My history of great detectives examines both police detectives and private detectives, but it’s safe to say that the most famous of real-life detectives all operated their own private practice sooner or later. (Though in nearly every case, they were also in government employ at other times in their careers.) Of those who did operate private detective businesses, I find the occurrence and fates of those which became family businesses an interesting area of comparison. Of the private detectives who did not bring their sons into the profession to succeed them, most simply had no sons at all. William Pinkerton had no male heirs, though the Pinkertons’ detective dynasty (of which William himself was a second generation) continued with his brother Robert’s son Allan II. Jonathan Whicher seems to have had no children at all, at least none who survived infancy; the same seems to be true, remarkably, of the long-lived and romantically profligate Vidocq. Childlessness was decidedly not a factor in the case of “Paddington” Pollaky, whose second wife Mary Ann Hughes bore at least four and possibly several young Pollakys; a number were daughters but Pollaky had at least one son to carry on the name. Nonetheless, despite establishing a thriving detective practice, Papa Pollaky apparently made no effort to encourage a son to join him and may well have discouraged the idea, for reasons on which I speculate in Brilliant Deduction. Detection as a family business seems to have been all or nothing, really, at least among my book’s stars. Ellis Parker did bring his son Ellis, Jr. in to assist with at least one case, though that one turned out disastrously for both Ellises and I don’t believe any of Ellis Sr.’s children ever really followed him into the role of detective. The only detectives in my study to bring in a second generation in a meaningful sense, meanwhile, also launched eventual dynasties lasting into third or fourth generations. Per the Library of Congress’s records, family direction of the Pinkerton agency persisted for more than a century, until the 1967 death of Robert Pinkerton, the great-grandson of Allan (and the grandson of the Robert Pinkerton profiled in Brilliant Deduction.) I’m less certain about the Burns agency, though I recall reading that a grandson of William Burns eventually succeeded his sons. I wonder what Allan Pinkerton would have thought about that. As well as two Joan Pinkertons, wife and daughter of the famous Allan. The son of Allan II, last Pinkerton to direct the agency, does not appear in Brilliant Deduction, but by this point the reader will probably have at least a 50/50 chance of guessing that his name was Robert Pinkerton. The Pinkertons were effectively the nation’s law force during the Civil War and the Wild West era. Allan himself planned strategy with Abraham Lincoln, hunted fraud for the great railroad magnates, and waged war against the Renos and the James Gang. With such famous company, Pinkerton and his agency never vanish for very long before some new retelling or re-imagining, from a children’s book, to a television documentary, to the fictionalized historic background of a Batman graphic novel. I happen to own the last item referred to, though I didn’t realize that it had any tie-in with great detectives when I purchased it. Or at least, great detectives other than the Dark Knight Detective himself, whose reputation as a detective is (IMO) more of a tradition based on his first appearance in Detective Comics issue #27 than on the modern character being particularly more of a detective than any other costumed crimefighter. 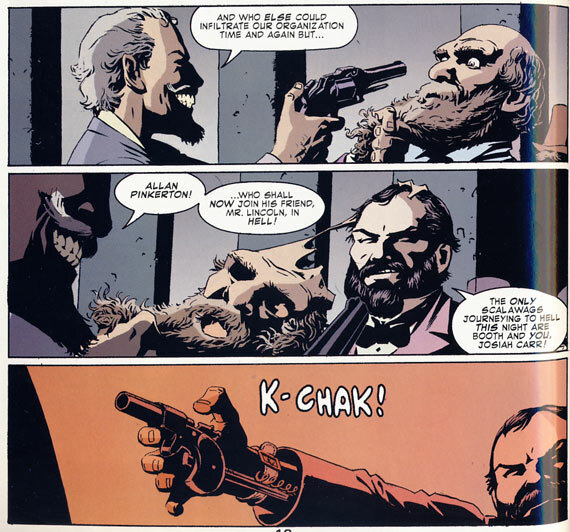 The 2003 graphic novel Detective No. 27 by Michael Uslan and Peter Snejbjerg, however, is an “imaginary story” which takes Bruce Wayne out of costume to unravel a mysterious conspiracy alongside a number of other famed detectives, some fictional and some historical. Copyright © 2019 Matthew John Kuhns. All Rights Reserved. Site by Modern Alchemy LLC. Based on the dyne theme by Lorelei Web Design.